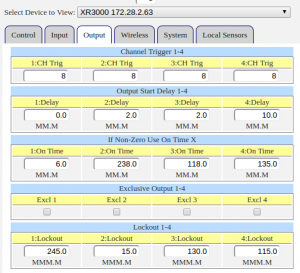 The XR3000 can be configured remotely to run a sequence of outputs at a scheduled time. These outputs can control relays, pumps, valves or any dry contact. 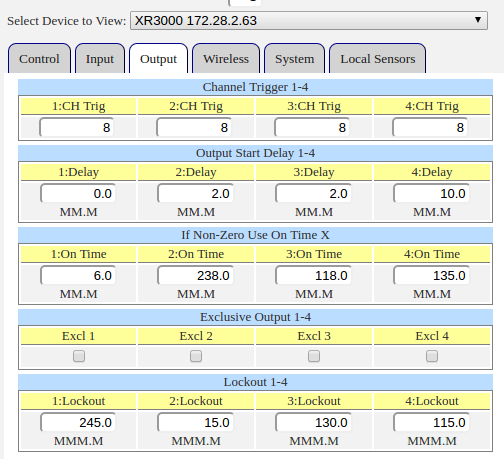 The XR3000 enables output sequencing by allowing an output to “follow” or be “triggered” by another output. Start delays and on times can also be defined. If an output is triggered by another output, it will only be On as long as the triggering output is On. In the case where a sequence of outputs is needed, but no single physical output will be on the entire sequence, some other triggering mechanism is needed. In this case, an unused output can be used as the “master” trigger output. In the example left, we have 4 outputs, a priming valve, pump control, a fertigation tank and an acid tank. 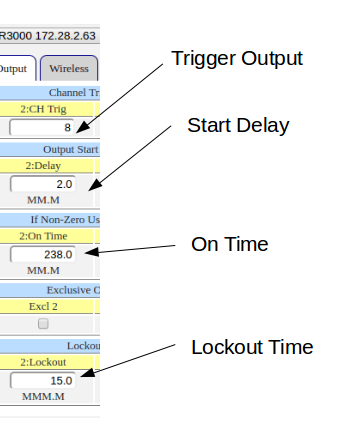 Since prime happens before pump control, none of these outputs can be used as the master trigger. Here you can see that all these outputs will run in sequence. Each has output ‘8’ setup as the trigger. Output ‘8’ is not actually physically wired to anything, but can be used as a “master” control to drive the outputs 1 – 4. Going back to the Control tab, we can see that up to 3 schedules can be setup. 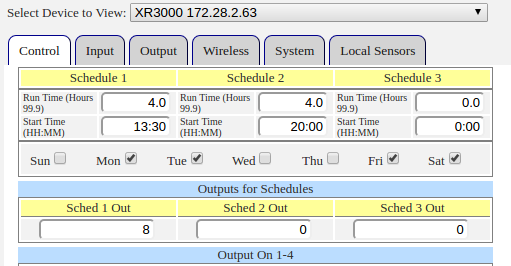 Note that under “Output for Schedules”, that output ‘8’ is set for schedules 1 and 2. Output ‘8’ will logically turn on at the programmed time, and stay on for the programmed duration. Thus it serves as the master trigger output.